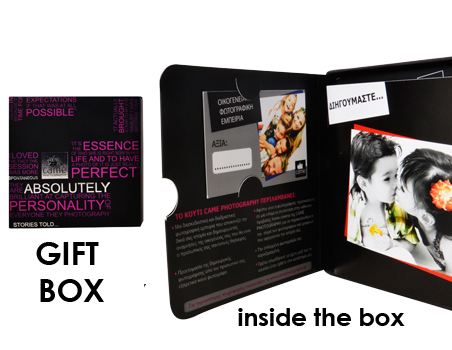 Impress with an original gift which includes a unique photoshooting experience ( duration 30mins) along with 2 Α3 photos printed on photographic paper. The gift will be included in a box with an impressive design. Moreover it will be accompanied by our company's prospectus which includes beautiful photos captured by our talented photographers. You can acquire the gift box either by courier ( extra shipping fees) or by coming to our company. For more information call at 210 68 47 500. Impress with an original gift which includes a unique photoshooting experience ( duration 30mins) along with one 30cmx30cm portrait on canvas or wood. Impress with an original gift which includes a unique photoshooting experience ( duration 30mins) along with one 35cmx35cm portrait on canvas or wood.